Crepe myrtle growing tree of the genus Lagerstroemia also known as Crape myrtle Lagerstroemia indica, Crepe myrtle perennial deciduous used as ornamental fragrant plant, can grow in subtropics, mediterranean, temperate, tropics or desert climate and growing in hardiness zone 5-10. Leaves color green elliptic shape. 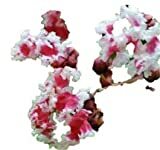 Flower fragrant color can be: white, pink, red or purple, the flower wrinkled like a crepe (like the Crepe myrtle).